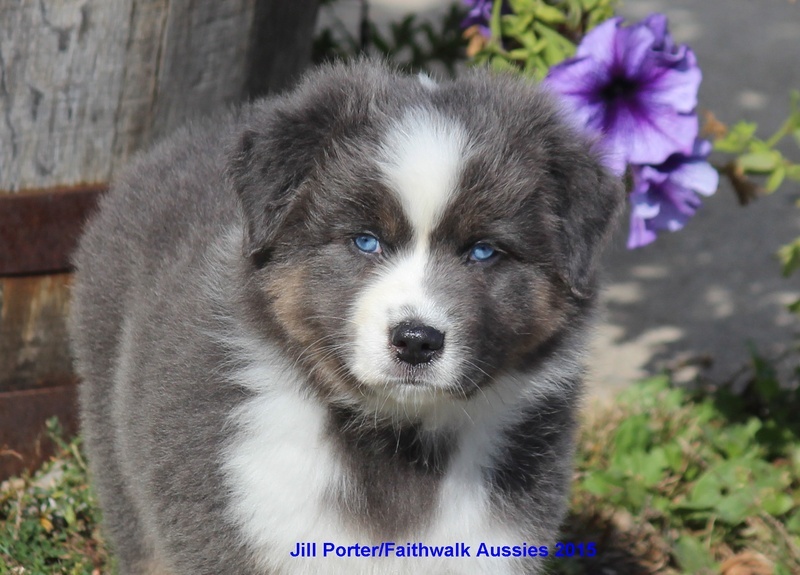 On this page I will share some info on various aspects of color, markings, eye color and pigment in Aussies. 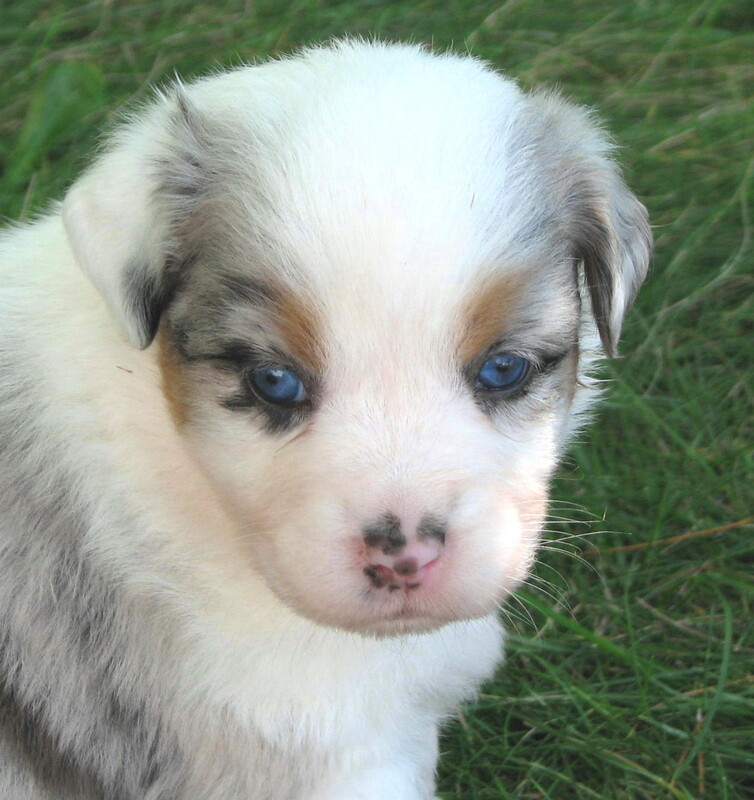 I have had people ask me about the pigment or lack thereof on the noses newborn or young Aussie puppies. It should be noted that on newborn Aussies, their noses are usually pink, especially in merles. The black (or brown pigment on reds) comes in as they grow. It will develop at different rates, but often tri pups get their pigment in faster than merles, and pups with less white on the face develop it sooner than ones with more white. That is not always the case however. Even similarly marked pups in the same litter may develop the pigment at different rates. In AKC, as long as 75% of the nose is filled in by a year of age, it's acceptable. In ASCA, all the nose must fill in by that age. I will also comment that I had one merle take several years to completely fill in, but he was not used for show or breeding. Once in a while the pigment never fills in, and this is a fault. It can leave the dog open to skin damage from exposure to the sun. Toward the bottom of the page, I have included a couple photos of a merle pup at various ages, showing how the pigment fills in, and some more info. It should be noted that pink on noses, the top of the muzzle, on eye rims and other exposed areas is subject to sunburn and has a potential to develop skin cancer. If your dog is to be out in the sun for any length of time, you can use a sunblock product to prevent that. White markings on the face tend to shrink with age. Collars don't change so much though, so a pup with a big or small collar will have that as an adult. In the photos below, it's the same Aussie on her birthday and at about 6 months of age. It shows how much the white blaze has changed. The shade of merling on a merle may darken wtih age too, depending on bloodline. 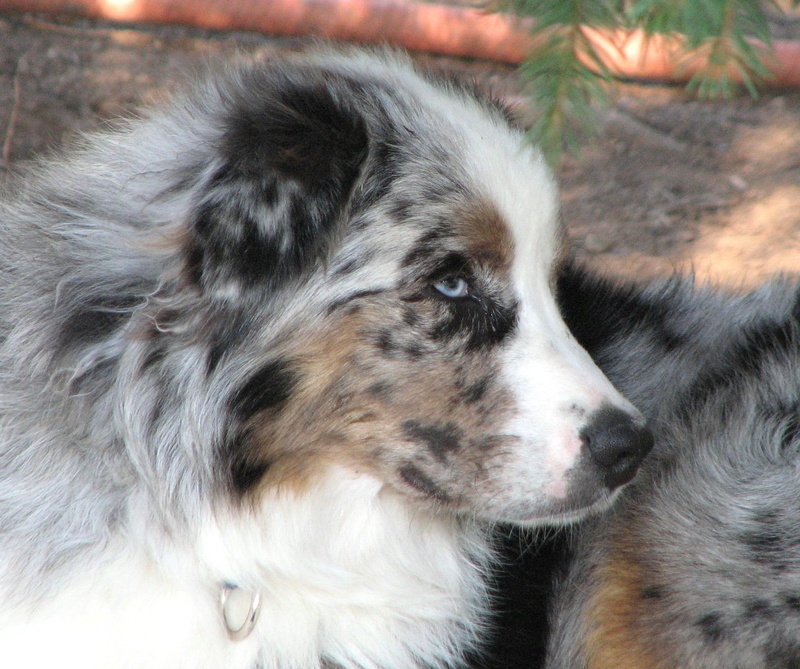 I have seen blue merle pups with merle so light it's hard to tell it apart from the white, when they are young pups. Then at middle age it's a medium shade of blue. The same can be said for red merles where the shade of merle may darken with age. 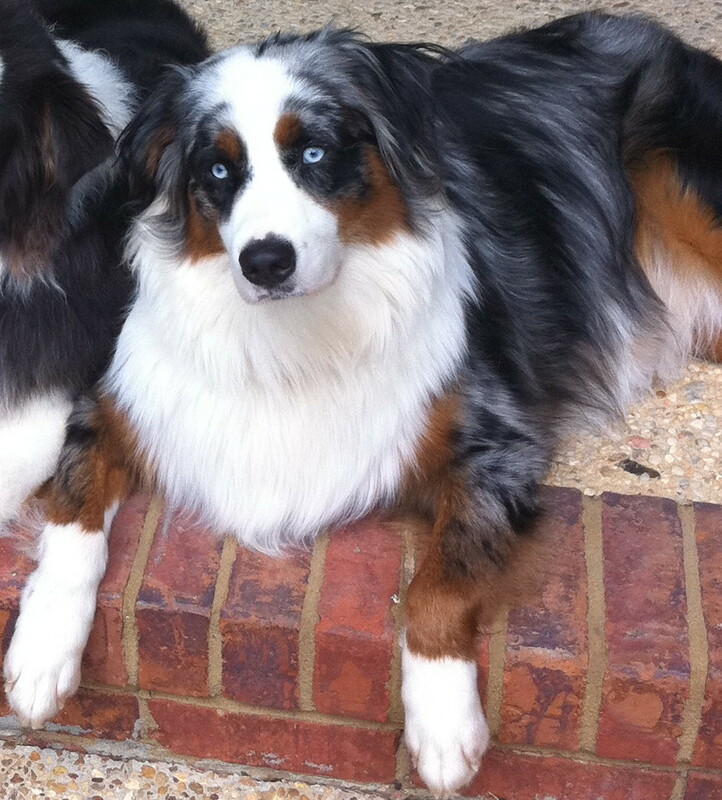 I put a picture of a blue merle Aussie below, showing her as a puppy and at 8 months of age. Her color has already darkened quite a bit. 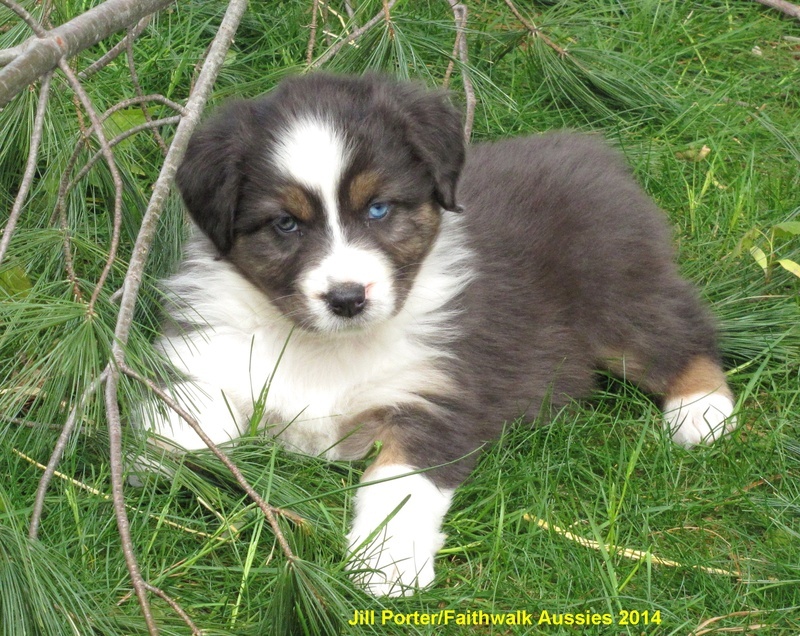 Below is another set of photos showing an Aussie as a puppy of about 6 weeks of age and again at about 3 years of age. You can see how much his coat has darkened in color, as well as his nose pigment filled in. His copper has gotten richer which is also normal. He's a gorgeous dog. Some black tri Aussies may get a reddish tint to their coats before they blow their coat. This will go away when the old coat sheds and new coat comes in. It is usually just caused by sunburn. It's even more noticable in red Aussies, as their coats are far more prone to sun bleaching than black or blue merle Aussies. Darker or deeper red Aussies may bleach to a very pale orange shade before they shed their old coat and grow a new one. Some Aussies also have "dilute" spots. 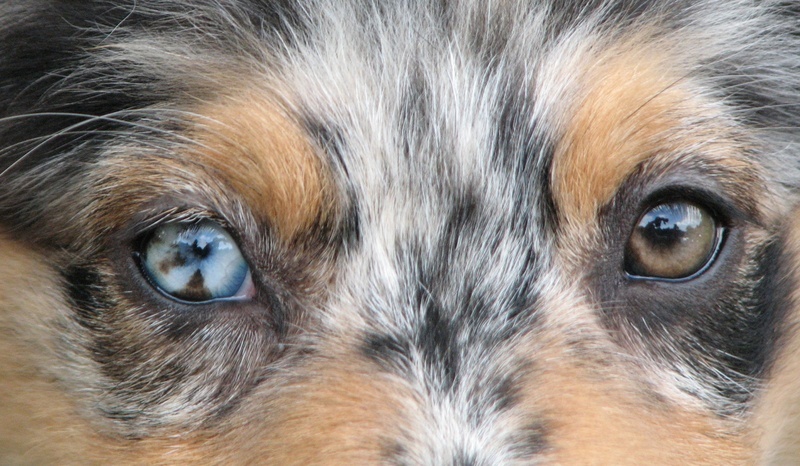 These are areas on a blue merle Aussie that are not affected by the merle gene, but are diluted from black to steel blue or sometimes a rusty brown. On red merles, it may be solid areas that are paler in color than the darkest brown areas. These are faults, but since many merles have a small dilute spot or two, it's not as big a deal as if there are large areas of dilution or many dilute spots. Here is a normal blue merle and black tri, and a blue merle pup on the far right with a huge amount of dilute area. 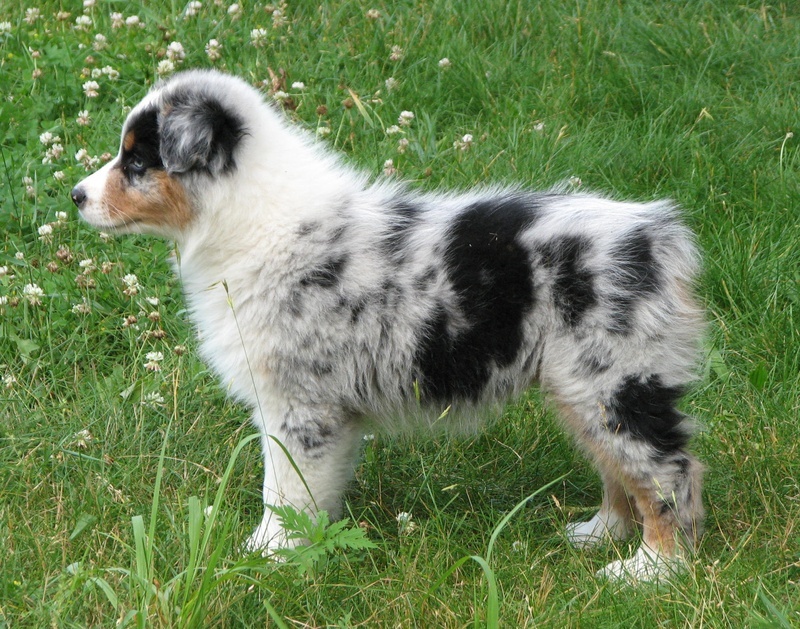 In a "normal" colored pup the steel grey would be dark black. There is no health risk associated with this color but it is a disqualification from the show ring and the pup shouldn't be bred. Most merles with some dilute spots are not this extreme. 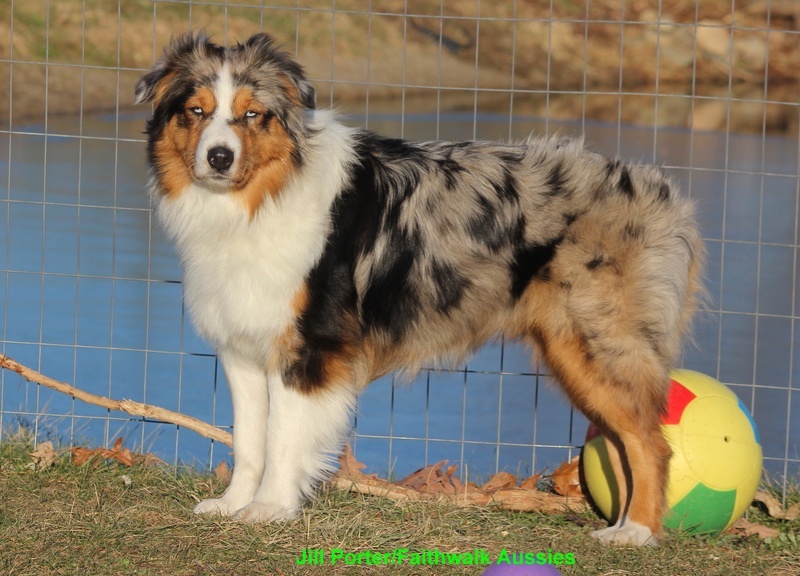 Below is another blue merle with a large area of dilute on her side. In her case it is showing as a brownish grey. Again it's just a color fault and has no health problems associated with it. 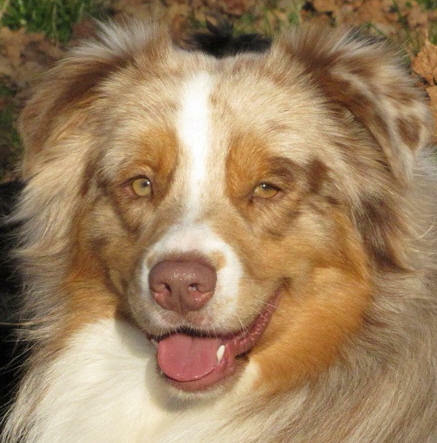 Below is a dilute red merle female. Her solid areas are pale, more like that of a Weimaraner than the richer or darker red normally seen in red Aussies. She is a pretty puppy and will make a great companion. 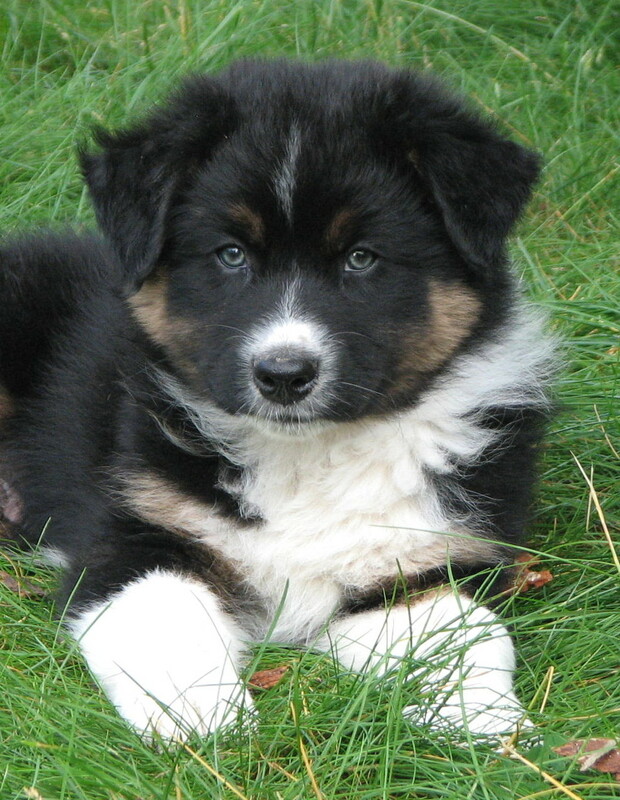 Below are two photos of a dilute black tri puppy. 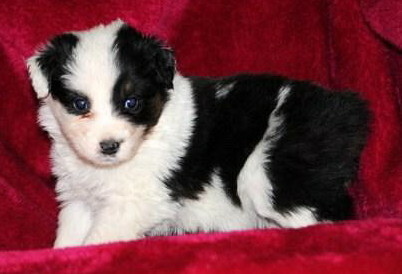 She has steel grey nose pigment and her coat will be a dark grey as an adult. This is a simple recessive trait, the D locus. She has to be dd at that spot, and both parents had to carry one copy. Her dam was a black tri and sire a red merle. She aslo has one blue eye which is not related to her coat color. Another photo of the dilute back tri puppy showing how silvery his color is. With markings such as copper or tan points, that also will become more rich and noticable as the pup grows. 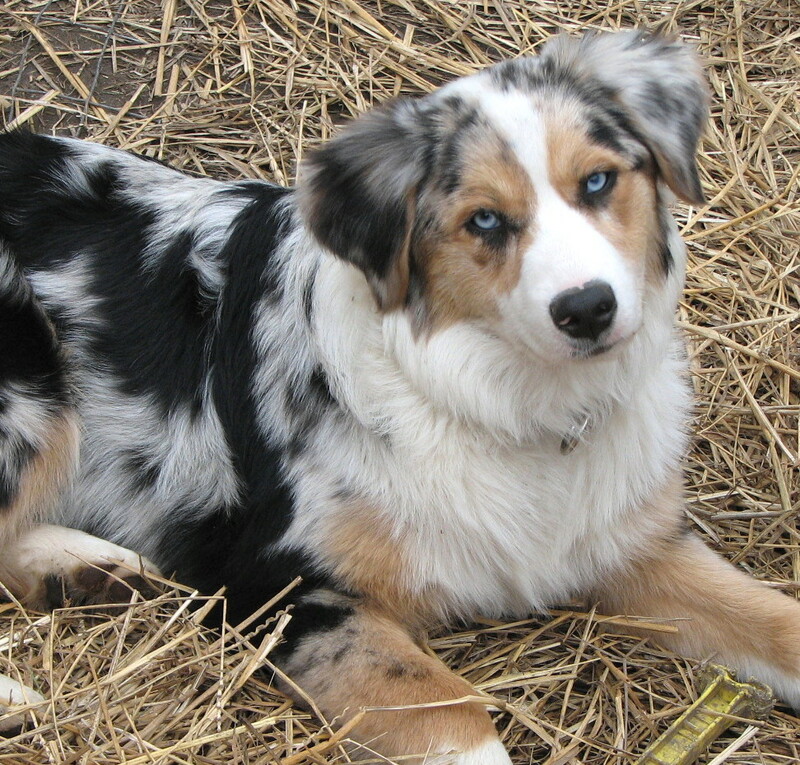 Many look almost bi-color at birth (tri or merle and white, without tan or copper points). 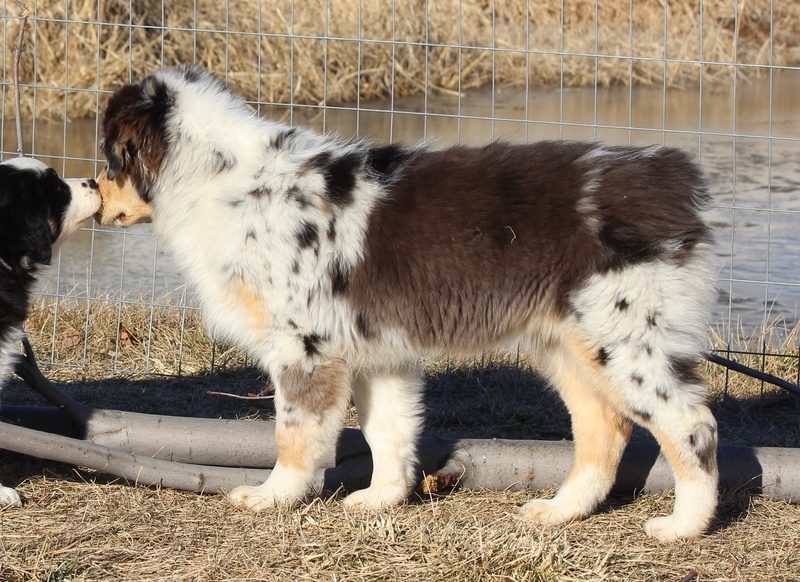 The black or merle covers over the points but the tan or copper becomes more rich as the pup grows, and even more so as the adult coat comes in. So just because a pup looks like it lacks the points at birth, doesn't mean they aren't there. If in doubt, look under the tail and if there is copper or tan there, the pup is a tri, not a bicolor. This pup is the same as the bi-eyed one on the right in the next row with 2 pictures. He was 8 wks old here and his copper was harder to see. You can also see he has less ticking here than as an adult. That's normal too, ticking may increase as the dog matures. I have added a picture of the pup as an adult, so you can see the increase in ticking, and how his white blaze has shrunk in size. His copper has become more rich, and his ticking is darker. Not all Aussies have ticking though. I also wanted to show some of the difference in the amount of copper in various lines of Aussies. I have seen them go from very dark faced "e-locus" masked dogs, to "average" ones, and on the other end of the range are dogs who have a copper mask that seemed to overpower the black areas around their faces. From what I have read, none of these is more correct or desirable than the other, though many people prefer one style over another. Very heavy e-locus mask pup and an adult with a moderately heavy e-locus mask. 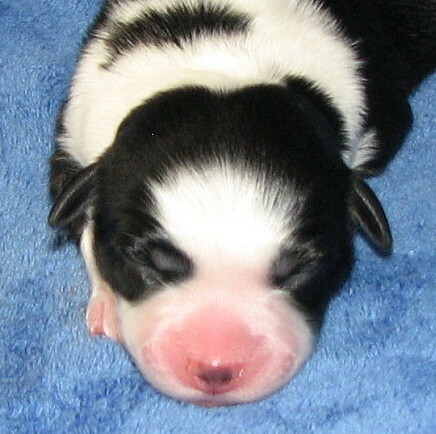 The pup barely has eye brow markings showing through, and more black all the way around the muzzle. It shows more since he has less white than some Aussies. The adult on the right is the same dog as pictured in the first two photos of this series. With the ticking on the dog on the right, it seems to be a dominant trait and will be passed on to offspring even if the other parent does not carry it. 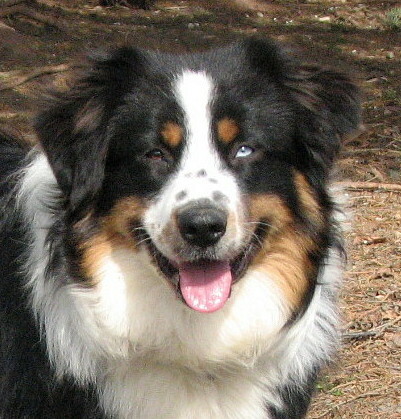 A more typical tri in the sense of copper markings, and one with a copper mask, where the black has faded around the eyes. His black markings around his eyes was solid when he was a pup, but faded within the first 6 months. A couple of these Aussies show ticking in the white areas. This is common and not a fault. Tri with extreme copper mask, and his daughter, a merle with copper mask. Sometimes these dogs will throw running copper on the body, though they don't have it themselves. They both looked more "normal" as pups but the copper grew more noticable as they grew. By a year of age the tri looked as he does in the photos. The merle was about 5 months old in the photo. Neither of these dogs has running copper on the body, just the face but did pass on the trait, which is a fault. This trait seems to be a very dominant trait and will be passed on through the generations. I don't care for the look as it is atypical and hard to breed away from. Above and below is the same female. She has running copper and it really spread as she got her adult coat in. The pup on the left in the photo of two pups is the same pup in the photo above on the right. He is just about 6 weeks older. It shows how the copper points become more noticeable as the pups grow. The "plain" looking little pups become far more colorful and beautiful as they grow. Here are two merles showing the e-locus mask (on left) and one without it (on the right.) The one on the right has richer copper but you can also see there is less merling in it. The one on the right has merling further down his cheek. If he was a tri he'd be more like the ones on the top pair of photos in this set. In breedings where one parent has an e-locus mask, it seems that many of the pups will as well. This puppy has white on the ear and plenty of white on her face. The only "mismark" is the partially white ear. Like many merles, she has a partially pigmented nose at this age, though chances are good it will fill in totally before she's a year of age. 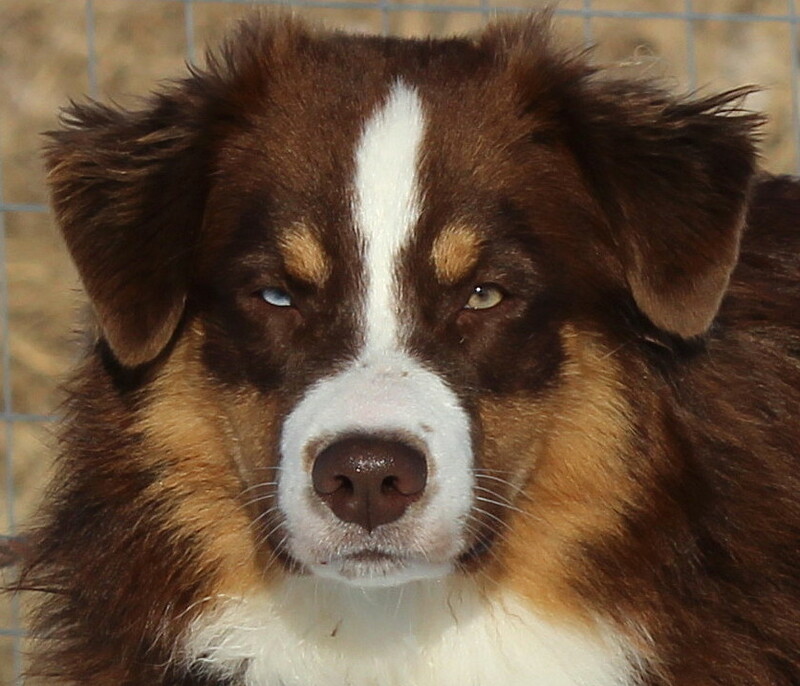 She is from a breeding of a normally marked black tri sire and a normally marked blue merle dam. In the picture on the left, she's about 4 weeks old, and is about 8 weeks in the center one, and 13 weeks old in the one on the right. You can see how much pigment has filled in during such a short time. I wanted to make a note about the white on that pup's ear. I have seen some people call this "pattern white" but it is just an extension of the Irish pattern that puts the white on faces, feet, chests and faces. There is also something called the "spotting gene" that creates random white spotting on the body of a dog, more like a pinto horse.. These are two different, and distinct genetic patterns. To my knowledge, my lines don't carry that as I've never seen in it any relatives or pups. This merle pup is marked correctly everywhere else and can hear fine. I have no reason to believe, if she was bred, she'd produce anything but an occasional pup with white on the ear, if any at all with that marking. Usually breeders will sell puppies with extra white as pets to be spayed or neutered. Another trait I see is where there is white going too high up the hocks and stifles on the back legs, or up from the underside into the sides. Besides the one below, I will try to add more photos of this soon. In the mean time you can read Shelly Hollen's site for good examples of this. The link is below. This puppy would be disqualified from conformation showing and should not be bred, as she has a very high chance of passing on this in many of her puppies. (She was sold as a pet to be spayed! She is from a litter bred by a friend of mine.) This is a recessive trait so both parents are carriers. Normally marked siblings may be as well. This puppy is a pattern white, meaning she has white outside of the allowed areas. She has white on her ear and further up her hind legs than is allowed in the standard. She also has white on her body. She is a healthy puppy and would make a perfectly wonderful pet. Thanks to my friend for the photo and permission to use it. Sometimes this site doesn't load properly and if that happens to you, try reloading it. It's a GREAT site! I wanted to include a section on eye colors in Aussies. 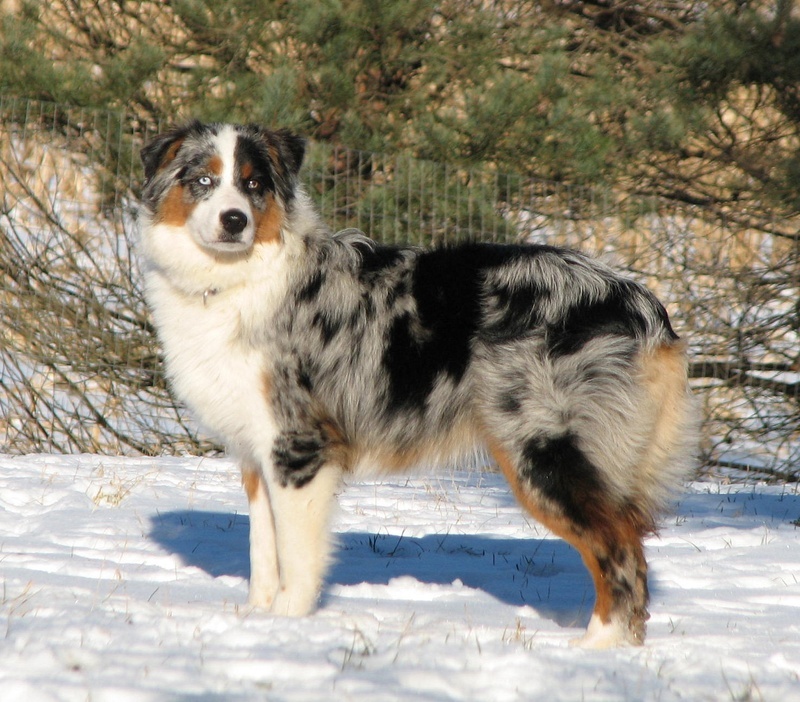 As with their coat colors and markings, they may have a wide variety of eye colors and patterns. 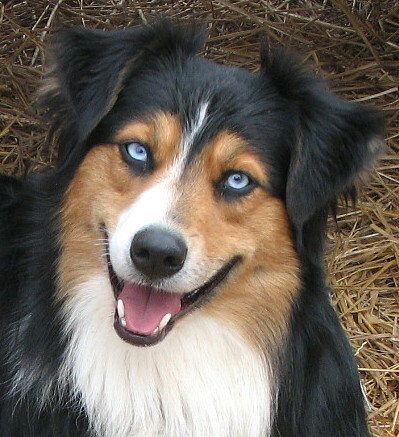 Some Aussies have solid blue eyes, or eyes that are brown, amber, or gold, in various shades but that are solid in that shade. 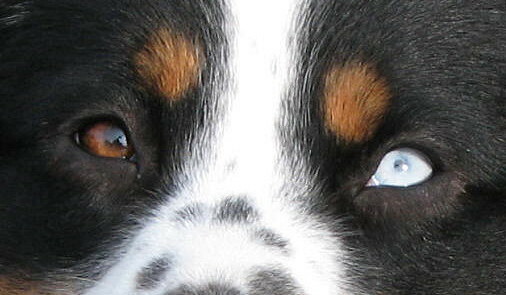 They may have two different eye colors like one of the tri dogs in the pictures above. Or, they may have marbled eyes were at least two different colors occur in the same eye. This is more common in merles but I have seen it in tri pups as well. 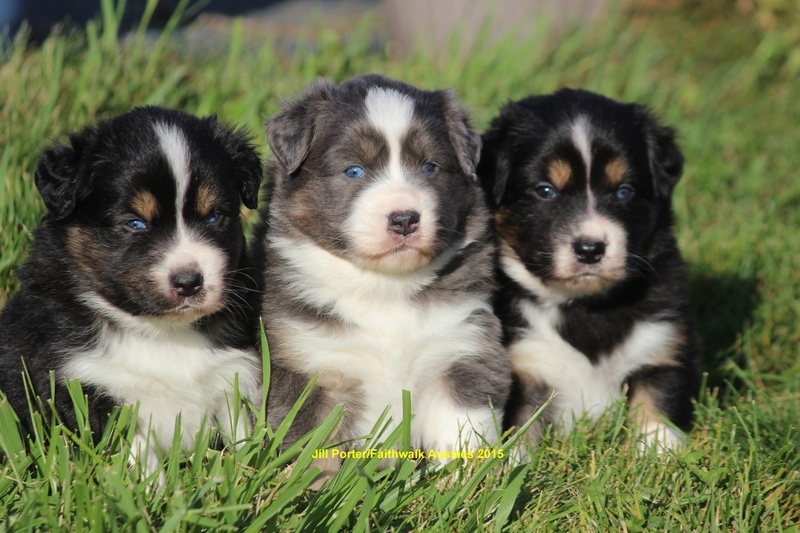 Usually those are tri pups from lines carrying the "blue eyed solid" or "blue eyed tri" gene (though that isn't an accurate description and blue eyed solid, since it can occur in bi or self colored Aussies, meaning all black or all red.) 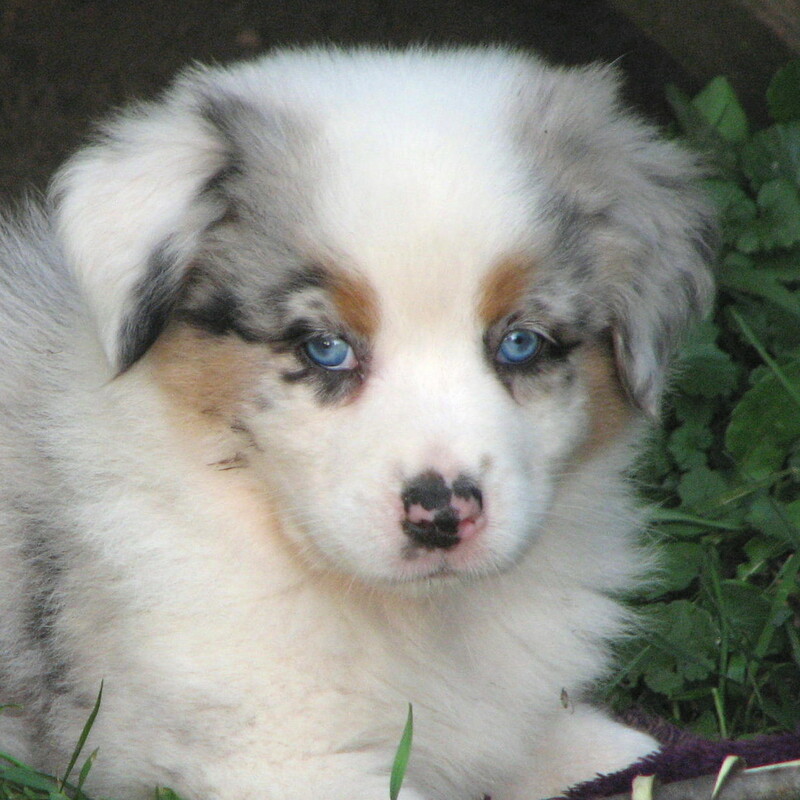 Blue eyes in solid colored Aussies (solid body color) is a somewhat recessive trait, but it isn't a simple recessive. It occurs more in some lines than others, and I've seen it skip generations. 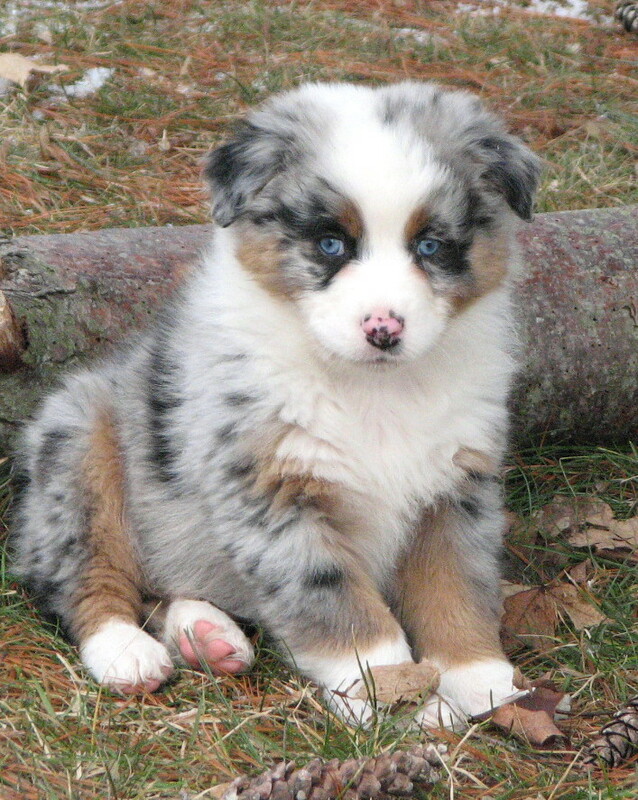 It's more common to have blue eyed pups in solid or merle if one of the parents has them though. I find it an appealing trait but like any good breeder, would never breed for just one trait such as blue eyes. I should also note that many red Aussies, tri or merle, may have a lighter shade of brown or amber eye color, if they are not blue eyed. It's similar to the difference one may see in a black Labrador Retriever, versus a chocolate one. Also, puppy eye color will change. 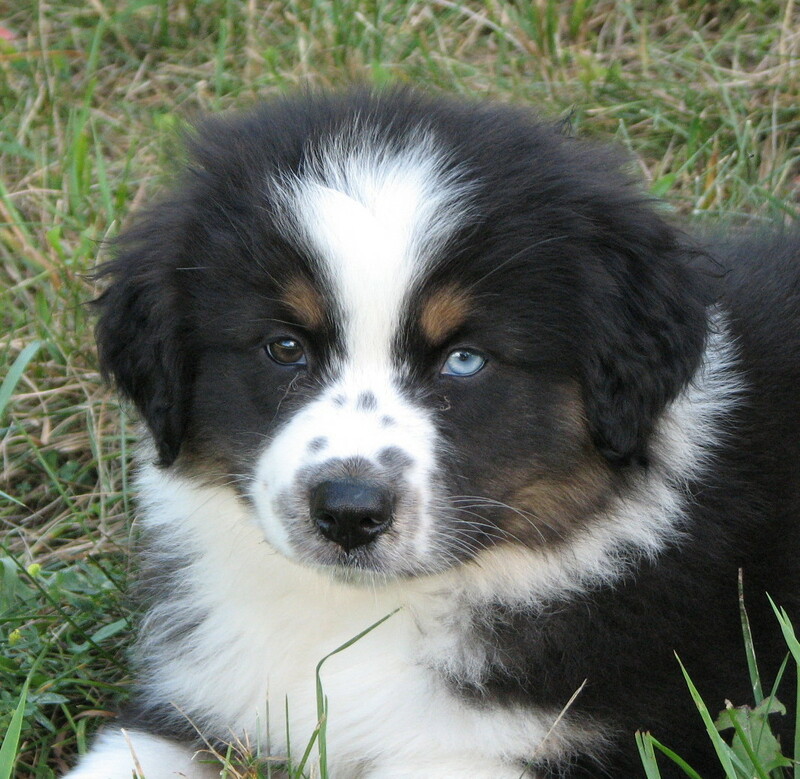 There is a picture on this page of a darker faced black tri pup who has almost green eyes. As an adult he will have a lighter shade of brown eye, rather than very dark brown ones. 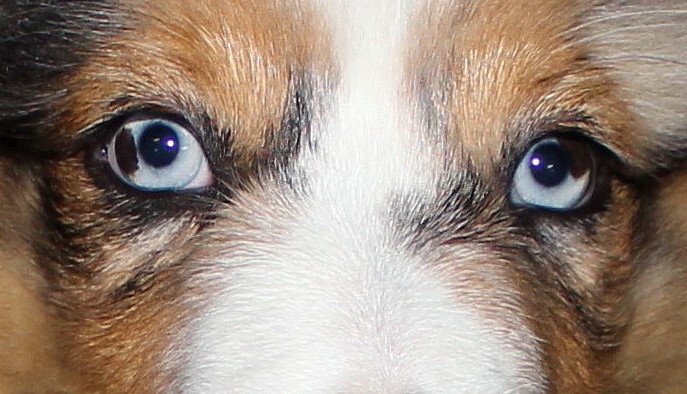 Even blue eyes in pups will lighten somewhat from puppyhood to adulthood. 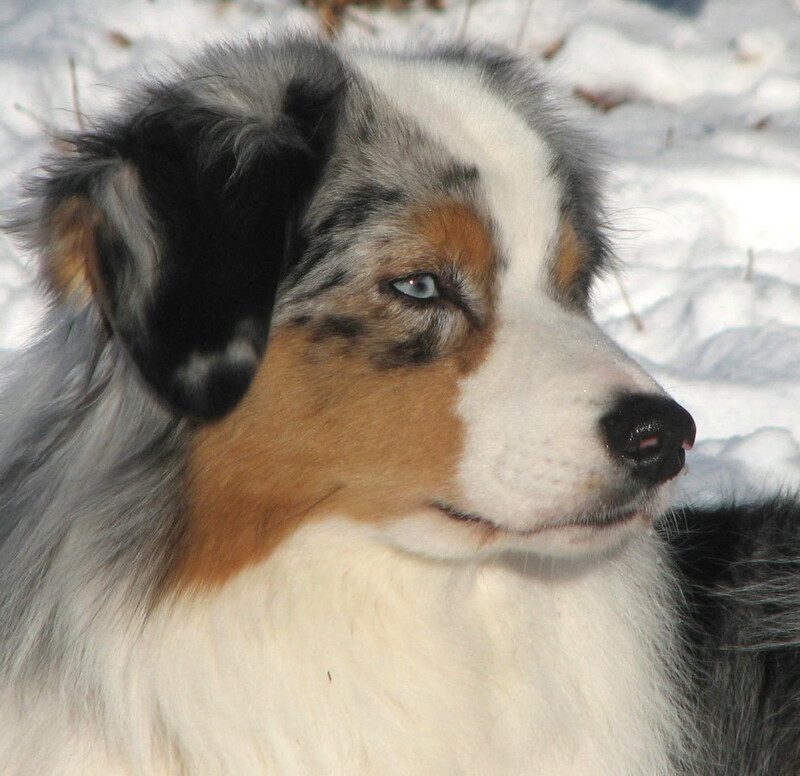 You can see many blue eyed tri Aussies on this site, as well as merles with various eye colors from blue, to marbled or brown. 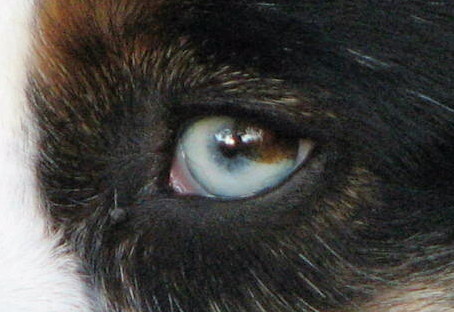 There are also bi-eyed (one of each color) or brown eyed tri Aussies pictured on this site. There is a great page on the ASHGI site showing a wide variety of marled or other eye colors, so I won't attempted to duplicate that here. One thing I should note is there are no more health problems associated with any particular eye color. 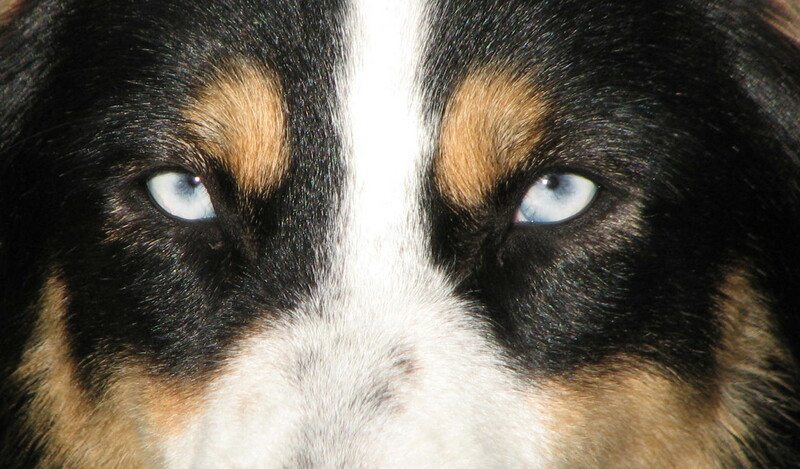 Uneducated people may try to claim blue eyed dogs are blind, but that is not true, at least not due to eye color. 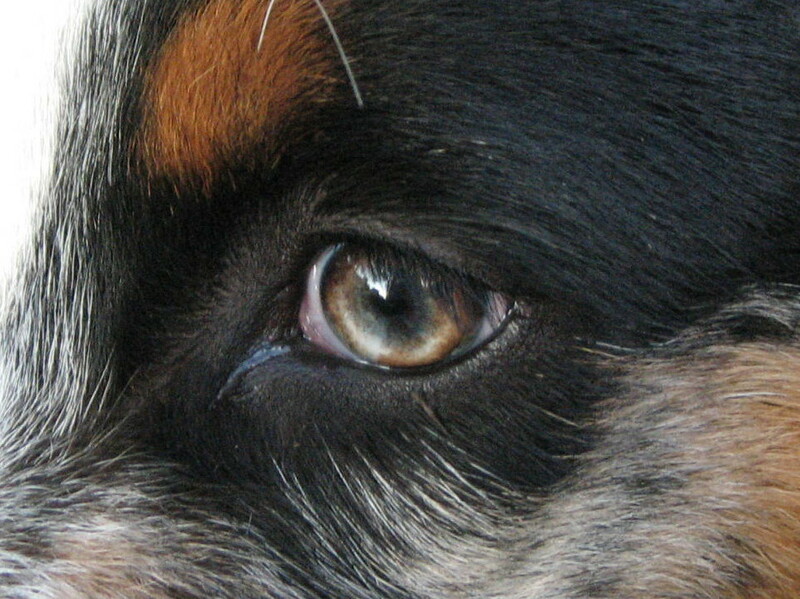 I CERF test all my dogs and as many others, have never seen a correlation between eye color and eye defects. 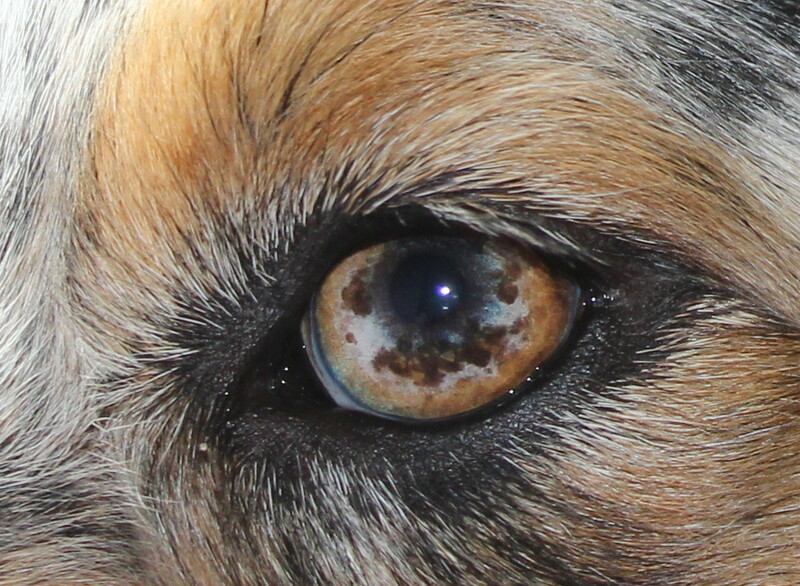 One thing I have seen is that a specific eye defect called an "iris coloboma" seems to be more common in merle pups than tri pups, but is still not a really common problem. I will show some of the variation in eye color in a few pictures below. Here are two examples of marbled eyes on blue merles. On the dog on left, she has just a little blue in the bottom, with a lighter shade of brown everywhere else. 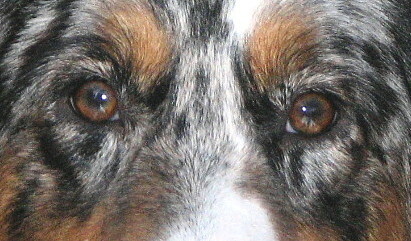 The dog on the right has a darker shade of brown area on a mostly blue eye. 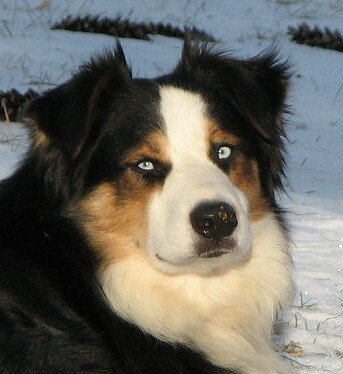 Here is a tri with a brown and a blue eye, and a tri with two blue eyes. This is a somewhat recessive gene. 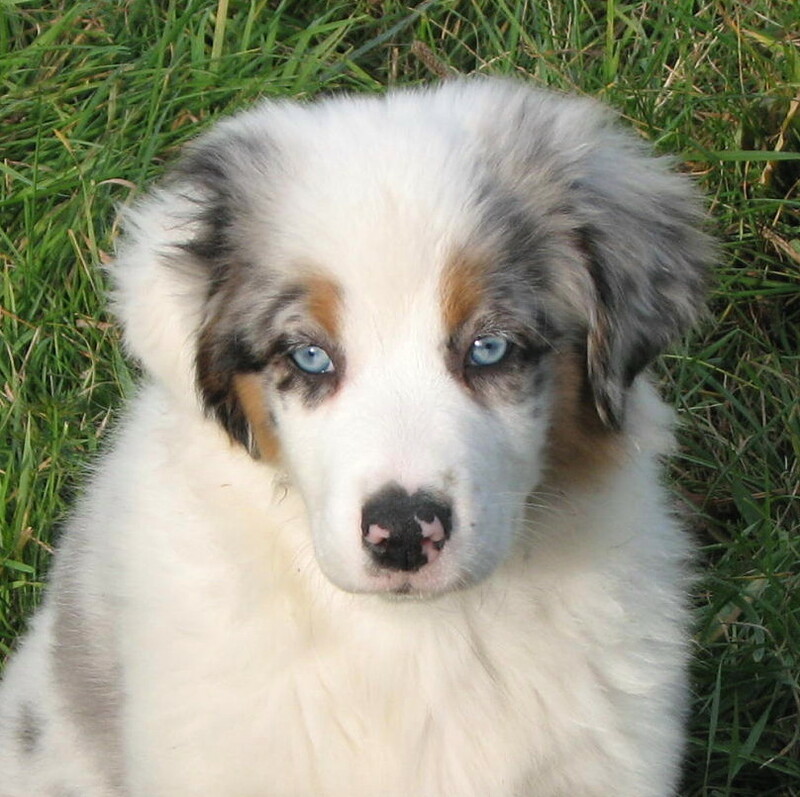 In merles, blue eyes can occur from this same gene or from the merle gene, which dilutes pigment. So in eyes, it will dilute darker eyes (shades of brown) to blue. 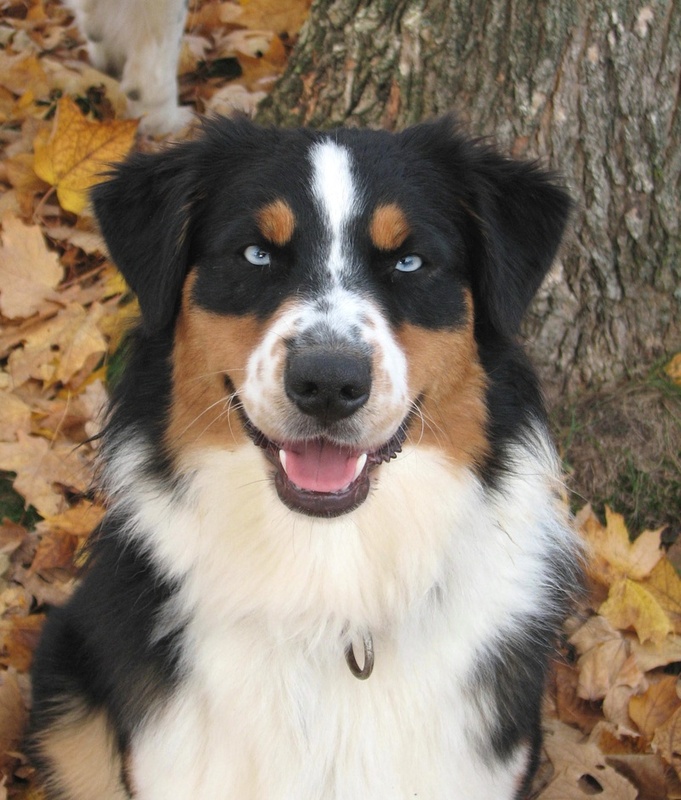 Some merles have solid blue eyes and some are marbled or split (two more colors in one eye.) You can also see different shades of copper on these two dogs. Here is a comparison of pigment on reds. While one is a tri and one a merle, you can see this variation on either pattern. Some red tris are pale, almost orange. Some red merles have very dark brown colored (liver) pigment. The dog on the left has dark, rich pigment. His nose and eye rims are a much darker shade than the dog on the right. 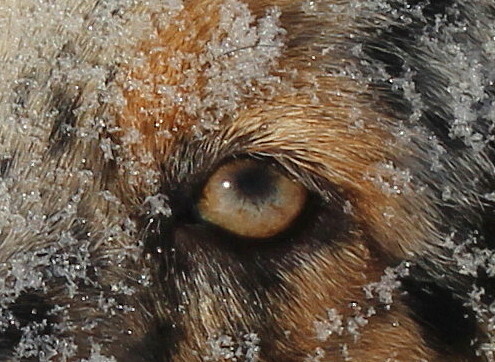 You can also see the lighter amber colored eye that is typical of a red. The tri on the left also has one blue eye. "Surely goodness and mercy will follow me all the days of my life, and I shall dwell in the house of the Lord forever."